LOUDON, NH., August 15, 2018 —Plan Tech, Inc. selected to produce thousands of urethane straightener bushings for one of the world’s largest automobile manufacturer’s. 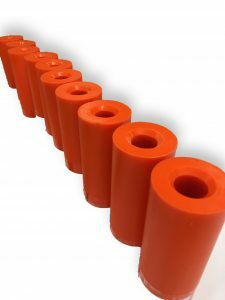 Typical construction of urethane straightener bushings is custom cast molded tubes with a special feature on one end of the tube to accept the matching part it will wear on. The material of urethane straightener bushings is also special with a blend of urethane and Armorglide. This special mix is essential for the operation of these bushings, without this performance additive the bushings would require to be greased frequently requiring downtime in the manufacturing facility.